Cosmo smashed straight into a tree trunk. He scrabbled with his claws, grabbed a branch and clung on to it, trembling. "Sorry," the young eagle said. "Look where you're going, son!" scolded Baldwig. "You've only been flying for a week, and that's the tenth tree you've flown into already! I learnt to fly a dozen years ago, but I've never hit a tree yet." He didn't know what was going wrong. He just didn't notice the trees until they suddenly loomed up in front of him; and by that time they were too close to dodge. His father sighed. "Let's give it another try," he said. "All the other eaglets are flying beautifully by now." "I know," said Cosmo, feeling guilty. "They're starting to hunt for their own food. Your cousin Marco even got a rabbit the other day! You've got a lot of catching up to do, son." "Well, try harder! Follow me." Taking off from the tree-top with a great clap of his wings, Baldwig swooped down the mountainside. Cosmo spread his strong wings and glided after him. Flying was wonderful. He loved the rush of the wind through his feathers, and the blur of colours sweeping past below. He thought he was good at flying. What he wasn't good at was landing. He just didn't understand why he kept on bumping into things. "Look out!" yelled Baldwig, as Cosmo collided with him in mid-air. "Clumsy!" sniffed Baldwig. "Keep behind me. We'll head for that tall pine tree." "Which pine tree?" asked Cosmo, peering around. "The one on top of that little island." "The island over there in the middle of the big blue lake." "Oh," Cosmo said. "What lake?" Baldwig stopped flapping and almost fell out of the sky as he turned to stare at his son. "What lake?" he said. "Oh, dear. Cosmo, we have a problem." The family perched on a ledge to talk about Cosmo's problem. "How come we never realised he can't see properly?" wailed his mother, Wayfair. "I never realised it myself," said Cosmo, staring at his feet. They looked quite clear. But nothing else did. The further away things were, the fuzzier they appeared. If they were a long way off, he couldn't see them at all. "How could you not realise it?" his father asked tetchily. "I thought everybody just saw blurs." "Blurs? How could you think that?" cried Baldwig. "Eagles always have perfect sight! We're famous for it. Our eagle eyes can spot a mouse a mile away!" "Well, you'd better learn. And quickly!" snapped his father. 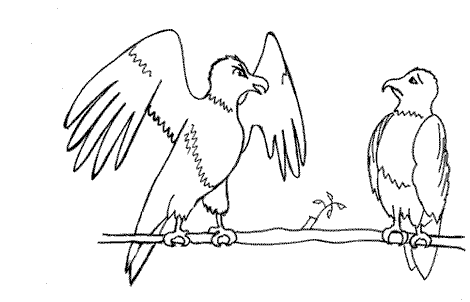 "We can't have a half-blind eagle in our family!" So Cosmo tried to learn to see. At first he practised flying with his parents, but Baldwig was so disappointed every time his son crashed into a tree that soon Cosmo gave that up. His cousin Marco took him along on flights, pointing out the landmarks down below. But no matter how hard Cosmo strained his eyes, he couldn't make any of them out. "It's hopeless," he sighed. "I can barely see a thing. I can't even hunt for myself - my parents have to catch food for me. My father's so ashamed!" "Maybe your eyes will get better as you grow," suggested Marco. "Well, I expect your father will get over it," said Marco. But Cosmo shook his head. That evening, he crashed into the eyrie three times before he managed a proper landing. "Sorry," he muttered; but Baldwig was furious. "Be more careful! You nearly smashed our eggs." Wayfair raised her wing to show him a pair of gleaming new eggs. "We're raising a second brood," she said lovingly. "And they're safer if you stay well away from them," his father added. "Sorry," said Cosmo, yet again. He flapped away and hit a nearby tree. Sliding down the trunk, he managed to balance on a branch and folded his wings. He blinked hard. Everything seemed even more blurred than usual. His eyes were wet. He knew why his parents were raising a second brood of chicks: it was because their first chick was such a failure. He huddled on his branch with drooping feathers, wondering what to do. He could only think of one solution. Marco flew over to join him. "What are you doing here?" "My parents have another clutch of eggs to hatch. They don't want me in the eyrie," Cosmo said unhappily. "So I'm leaving." "Yes. I'm useless. I'm just in their way." "You're not!" said Marco. "I'll hunt for you. I don't mind." But Marco could not persuade him to stay. Eventually, as it grew dark, Marco had to return to his own nest, leaving Cosmo alone in his tree. Soon the eagles were all sleeping - except Cosmo. The moon rose and filled his world with blurry black and white. Cosmo made his mind up. He could see just as well by the moon as by the sun; or rather, he could see just as badly. If he left now, Marco could not follow. And his parents would be relieved to wake up and find him gone. So he spread his wings and flew. Cosmo flew for hours, although he had no idea where he was going. At night, there was no sun to give him a sense of direction, and he could not see the stars. None the less, by the time the sun came up, he was sure he must be many miles from home. As dawn lit up the sky, he crashed down into a tree. Exhausted after flying all night, he perched on a branch to rest. He was hungry, too; but how could he catch food? He couldn't even spot a cow, let alone the rabbits or voles that the other eagles caught. "I expect I'll starve to death," thought Cosmo mournfully. Cosmo nearly jumped out of his feathers. That was an eagle's screech, not far away! He saw the brown blur of a flying bird taking off from a nearby tree. Cosmo huddled close to the tree trunk until the wing beats disappeared into the distance. The strange eagle must have just woken up, and was setting out to hunt. He hoped there were no more around. No eagle colony would want him. As he peered through the leaves, checking for more eagles, he saw something moving down on the ground. He couldn't tell what it was. However, it wasn't a cow or a deer; for it was far too long and thin. It wasn't a snake either: it was much too straight. Cosmo screwed up his eyes to try and make them see more clearly. He stared intently down. The creature was coming closer. Suddenly he realised that it wasn't an animal at all. It was something made out of a long row of sticks. There was a man at either end; and they were carrying this strange object between them. Cosmo had seen men a few times before, but he had never seen a ladder. So he was puzzled when the two men raised this long, strange object and propped it up against the tree next to his. As Cosmo watched, fascinated, one of the men began to climb. "Men climbing trees?" thought Cosmo. "How clever! I didn't know they could behave like squirrels!" He was so impressed that he wanted to see more. Trying to get closer, he shuffled very quietly along his branch until he was right at the end. He peered at the nearby tree. Now the man was just below him. He had reached a big fork in the branches, and stopped. Cosmo could see him moving. But he couldn't tell what was happening. It was just a blur. "What on earth is he doing?" wondered Cosmo, and he edged just a little bit further along his branch to try and see. All of a sudden there was a loud snap. His branch gave way. Cosmo found himself tumbling headlong through the air. He tried to spread his wings, but they slammed into the tree. Desperately Cosmo tried to right himself. Tumbling over in mid-air, he furiously flapped his wings, until, to his relief, he felt himself shoot upwards. But he was still out of control. A blurred shape loomed in front of him. It was the man in the next tree. He was leaning over something, and reaching out his arm. And then Cosmo saw what was in the fork in the branches. "A nest!" he gasped. "With eggs! I mustn't crash into it!" He just managed to swerve aside in time. He missed the nest by the width of a feather. Instead, he crashed straight into the man. "Sorry!" squawked Cosmo, as he knocked the man sideways. "Sorry!" he cried as the man half slid, half fell down the ladder and landed on top of the other man who was standing at the bottom. "Sorry, sorry!" he called down as they both crumpled in a moaning heap at the foot of the tree. "Oh, no. I think they're hurt!" Cosmo was horrified at what he had done. He flew down to see if he could help the men. They were just getting back to their feet when he crashed into them. "Sorry!" he screeched as they tumbled head over heels. He tried to swoop closer and grab them with his talons to help them get up again. His first swoop raked through the hair of one man. Before Cosmo could turn round for a second swoop, both men scrambled to their feet. They hobbled away through the forest surprisingly fast. Cosmo landed on the ground with a thump. "Sorry! Sorry!" he called guiltily after the departing men, until he could no longer see them. He sighed and looked down. Something glittering lay on the ground. He bent and picked it up in his beak. One of the men must have dropped it when Cosmo swooped at him. He had noticed a faint glitter... But Cosmo had never seen anything like this. The thing was made of wire, looped around two glass circles. Two more bits of wire stuck out on either side. "How very strange!" said Cosmo, holding it in his beak to peer at it. Then he noticed something even stranger. When he gazed through the glass circles, everything looked sharp and clear. Cosmo raised his head and stared around in wonder. "Amazing!" he said. "So that's what a tree looks like!" He fumbled with his talons to bring the strange glass circles closer to his eyes. Then he carefully bent the wires with his claws until they clung firmly to his beak. Cosmo took off. Flying up to the top of the tree, he made a perfect landing with ease. The glass circles stayed fixed in place as he turned and gazed down. What he saw astonished him. "So that's what the world looks like!" he gasped. "And there are those two men!" Far below, he saw the men limping down a track. Then a car came roaring up: it had bright stripes, and blue lights flashing. As Cosmo watched with interest, three more men jumped out of the car and grabbed the first two. "Oh, good," said Cosmo. "Somebody's helping them. I don't need to worry about them any more." He turned back to the view spread out below him. He could see a big blue lake, with a little island, and a pine tree in the middle - and two eagles swiftly flying towards him. With a rush of wings, they landed on his branch. "What are you doing here?" cried Cosmo. "Watching you almost crash into our nest," his mother said. Cosmo looked down at the nest with two eggs lying in it. "Well, of course it is! Don't you recognise it?" Cosmo shook his head. He had never seen it clearly until now. But how could he be back home, after a whole night spent flying? Then he realised that without being able to see where he was going, he had flown round in a huge circle. "Sorry." He hung his head, thinking what a useless eagle he was. "What do you mean, sorry?" Wayfair asked. "You saved our eggs! We saw it all from high up in the sky. Those men were just about to steal them!" And Wayfair opened her great wings wide and hugged her son. Then she flew down to the nest to check her precious eggs. "Those egg thieves won't be back in a hurry after the way you attacked them!" said Baldwig with a chuckle. "I'm proud of you, Cosmo! You really scared them off." "You certainly did. Well done! I don't care if you can't see - I'm happy to go hunting for you any day." "I don't think you'll need to," Cosmo said. "But thanks." His heart swelled with happiness. For through the glass circles perched upon his beak, he saw what he had never seen before, and had never hoped to see: a look of loving pride in his father's eagle eyes.